This is a list of a few things that I should have blogged about when they happened. Instead I am writing them as a list to let you know that there really are cool things in HK and I don’t just wander aimlessly about. Excuse me while my detail suffers and scope broadens. 1 I went to Ocean Park. 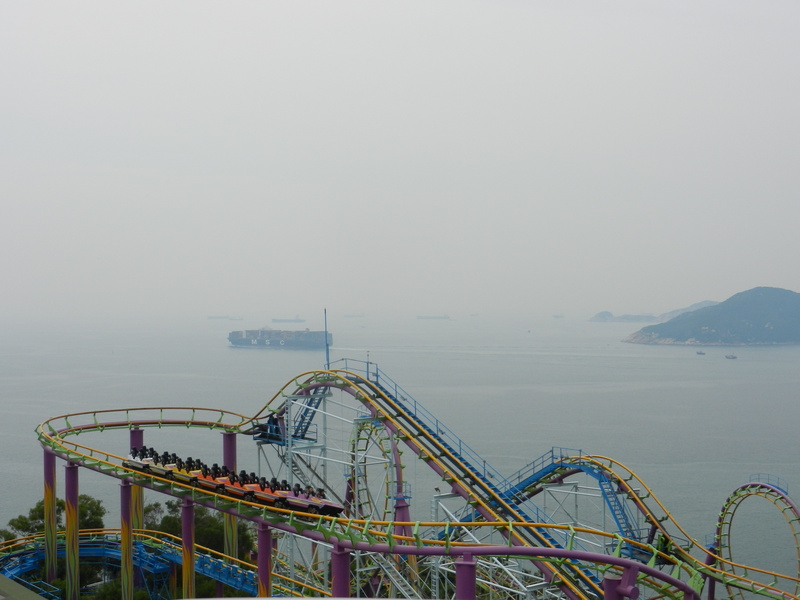 The roller coasters are located on the edge of a mountain overlooking island in the South China Sea. You go around a turn and see the horizon of tropical paradise; you are upside down mid loop and gazing at a stunning beach back dropped by a mountains. The best part is not the roller coasters, nor the view, however. The best part of the day were the zoos and aquariums. Our first foray into this world was the Jellyfish exhibit: dark ominous hallways lined with glass tanks of glowing drifting creatures. 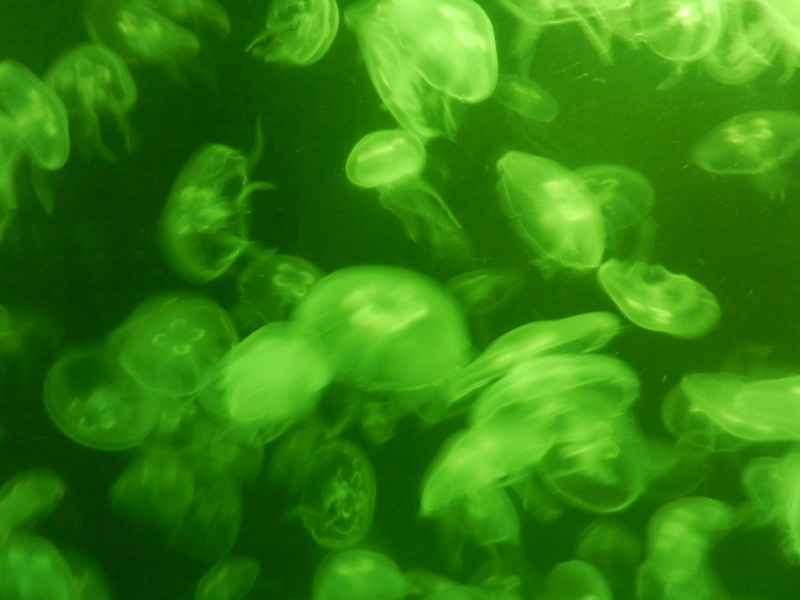 At one point we stared, mesmerized for 10 minutes as the light changed colors from green to red to blue to yellow to white and back on a wall sized tank full of floating jellies the size of my fist. The Pandas are also nothing to sneeze at. We saw 4 regular pandas and 2 red pandas. The regular ones all looked depressed and angry. 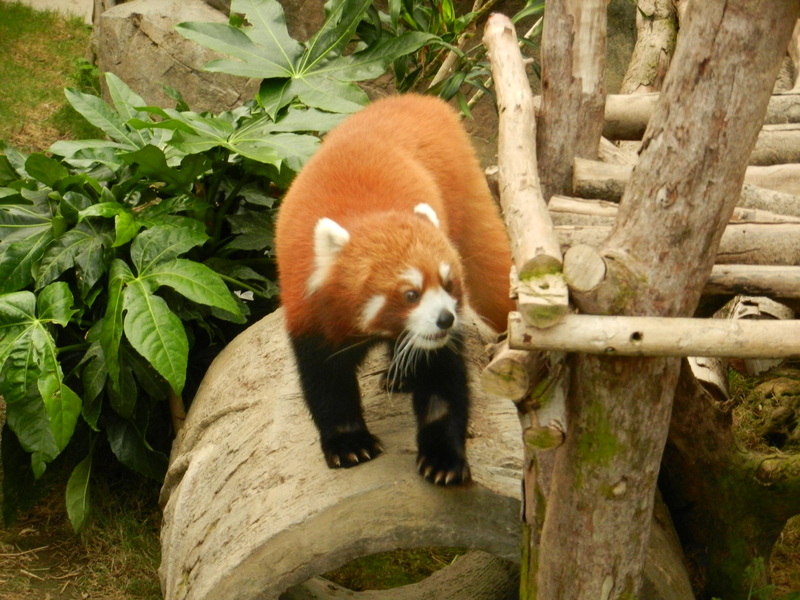 One red panda was doing laps around his habitat. He was cool. Then there was a fantastic goldfish exhibit where they had puffy cheeks and weird crowns. That can’t be evolutionarily beneficial. We rode a merry-go-round that had gold fish and seahorses and sharks instead of the traditional horses. 2 People take photos with us. This has happened to Erica and I twice. The first time was in Macao, in a lovely garden. I think the women were speaking Portuguese, and they gestured about their camera. It took a while to understand they wanted a photo with us. We obliged because it was weird and novel. We wanted to get a photo of them getting photos of us, but neglected to, unfortunately. At Ocean Park we were in an aquarium and these two Chinese women gestured at their camera. I thought they wanted me to take a photo of them, so I was going to be helpful. I moved to a reasonable vantage point, but they shook their heads. They wanted to take a picture with us. One of the girls had slightly too hard a grip on my upper arm as they took the photo, she may have been scared we would run away like wild animals. 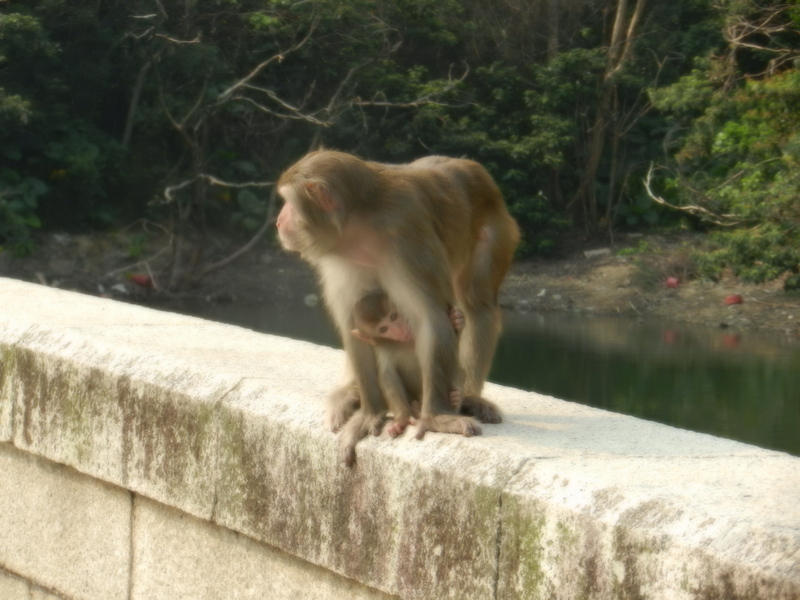 3 I walked around with some monkeys. Erica, ML and I went to monkey hill a few weeks ago and made some monkeys feel frightened, and we did not feed them because they are a nuisance. One of them snarled at us and lunged. We ran away. Monkeys here are like squirrels in Boston (this comparison may be more apt to my roommate who fears squirrels than anyone else). The monkeys are small but there are many of them, and they have disease. Over the summer I had gone hiking with Pete near this location, and one monkey threw nuts at me from his tree because my camera was making noise and we were intruding. Monkeys are intense. Also small and adorable. Especially when they are babies clinging to their mothers’ bellies as they trot to a new spot. 4 I went to the Jade Market. This place has lovely strings of beads and stones and some people trying to rip you off. But at least it is cheaper than Chow Tai Fook. Chow Tai Fook is the most common jewelry store, and it may have more locations than Starbucks. At some points on Nathan Road (the main thoroughfare in Kowloon) you can see 6 at once on the same block. If you want jewelry, in HK, go to a market, and pay about a 3rd of the first price. It’s much more fun. 5 Everything that happened in the summer. I might write about it and throw it on the blog, I might not. There are more things that happen, but I haven’t quite given up on writing full stories for all of them. Maybe I will yet!